As Arizona Sen. John McCain tries to close the gap with Barack Obama in the final weekend leading up to Tuesday’s presidential election, his task is to convince the American people that he’s the right man to lead the nation at a time when America faces daunting economic challenges at home and urgent national security threats abroad. Voters, for their part, must discern whether McCain has the right stuff to move the nation in the right direction. A useful metric to take a measure of the man is temperament — that is, McCain’s mental and emotional predisposition to action. In an article in the October 27, 2008 issue of Time magazine titled “Does Temperament Matter?” Nancy Gibbs writes about McCain’s “fiery” temperament. That is consistent with the findings of four separate personality studies I have conducted since 1999 with student research collaborators in the Unit for the Study of Personality in Politics at the College of St. Benedict and St. John’s University. In a paper presented at the annual scientific meeting of the International Society of Political Psychology in July 2007, I identified temperament is a primary consideration in a presidential candidate well prepared and qualified to assume the Office of President of the United States. 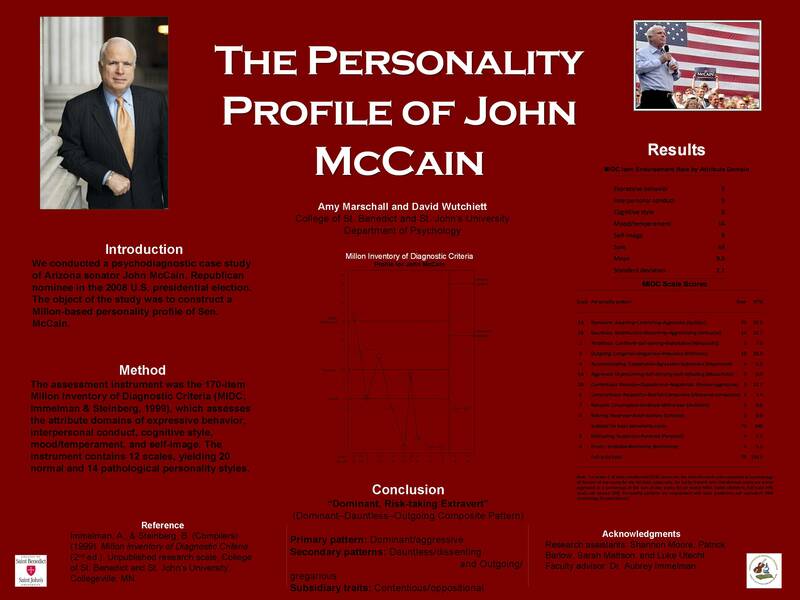 To counter that charge, my students and I have noted in published reports that dauntless, fiery individuals such as McCain typically become less volatile and impulsive after midlife and that in the Oval Office, McCain, now in his seventies, would likely not display the same degree of hotheadedness as he did earlier. In that sense, we considered his age a positive. Turning to the relationship between temperament and leadership, political scientist Stanley Renshon, in his 1996 book The Psychological Assessment of Presidential Candidates, asserted that the political implications of angry episodes hinges on five critical questions. First, are the temper outbursts occasional or regular? Despite the Arizona Republic’s claims that McCain “often insults people and flies off the handle,” none of the news accounts we examined suggested that the outbursts were particularly frequent. Though sometimes characterized as “volcanic” or “volatile,” indications are that McCain’s lapses in emotional restraint, though recurrent, are intermittent and sporadic. Second, are there particular issues that set off the displays of temper? In his autobiography, Faith of My Fathers, McCain blamed affronts to his honor or dignity as triggers for his anger. However, a Nov. 2, 1999 report in USA Today by Jill Lawrence suggests that McCain does not, in fact, select the targets of his anger as precisely as his autobiography would have the reader believe. She quotes former Tennessee Sen. Fred Thompson, a longtime McCain friend and supporter, as saying that McCain “has been known not to suffer fools very gladly.” In other words, McCain’s displays of anger are not limited to personal affronts. Third, does the candidate easily recover from angry episodes, or does he nurse grudges? Former Republican Gov. Jane Dee Hull of Arizona has said, “John has a long memory” for personal slights. According to the USA Today report, McCain “can hold a grudge for years.” But Mike Hellon, at the time Republican National Committee member from Arizona, told USA Today, “Once he’s blown, it’s over, it’s done with.” That’s consistent with McCain’s ability to work with President George W. Bush after their bruising primary battle in 2000. Fourth, does the candidate berate or belittle those unlikely or unable to retaliate? For the most part, McCain’s wrath, as reported in the media has been directed at political peers or reporters from his home state of Arizona, whom he’s reportedly lambasted as “liars” and “idiots.” Thus, to McCain’s credit, his anger is generally expressed directly and is not directed primarily at subordinates or defenseless victims. Fifth, is the candidate aware of, and does he try to control his temper? The Arizona Republic reported that McCain acknowledges his “propensity for passion,” though he denied claims that he insults people and is quick to “fly off the handle.” By his own admission in his autobiography, McCain is well aware of his anger. Voters should keep in mind that it is precisely McCain’s fiery temperament, toughness, and resilience that earned him his reputation as a fighter — in Vietnam, where he verbally assailed his captors, and on Capitol Hill. Thus, in one sense, McCain’s temper, beyond its less admirable aspects, also embodies passion, courage, and straight-shooting candor. But whatever the deeper meaning and political implications of an unruly temper, character, personality, and temperament are legitimate public issues. This is the opinion of Aubrey Immelman, associate professor of psychology at the College of St. Benedict and St. John’s University, where he directs the Unit for the Study of Personality in Politics, a faculty–student collaborative project with the mission of conducting psychological assessments of candidates for political office and disseminating the findings to professionals, the media, and the voting public.